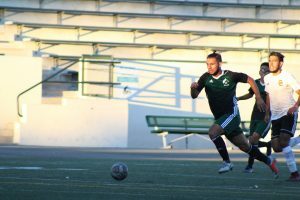 A goal scored at minute 85 from East Los Angeles College freshmen forward Andres Aceves allowed the Huskies to win 2-1 on Friday against Glendale College. The goal came from a play by ELAC freshman midfielder Alexis Arroyo who dribbled the ball as he sprinted through the left wing. Arroyo passed the ball to Husky freshman forward Denilson Rivera, who controlled it at the center of the penalty box and passed it to Aceves to score the winning goal. “I just enjoyed the moment. It is good to always help out the team,” said Aceves. The Huskies took control for most of the game. ELAC missed many goal opportunities throughout the game. “We did a lot of combination plays and we kept the ball a lot of time. We were often attacking. Unfortunately, we missed a lot [of opportunities to score],” said Husky Assistant Coach Ricardo Raygoza. They had no communication and often made mistakes inside their area that led them to frequently lose the ball or miss in their passes. “We were in the game following the plan we practice every day, however, we need to minimize errors,” said Glendale Head Coach Laura Matsumoto. The Huskies took the lead at minute 36 when freshman midfielder Paulo Macedo Nahashique took the ball in the midfield, where he dribbled three defenders, and passed it to sophomore forward Rene Sanchez who shot from inside the penalty box and scored. Glendale tried to tie the game in the first half, but they couldn’t because the Huskies midfielders stole the ball, pressured the defense and made good passes. “We practiced a lot of combinations between the midfielders during the week. The desire to want the ball possession more and play it forward helped us a lot during the game,” said Raygoza. During the second half, the Huskies’ offense continued to attack, but an error at minute 60, where the center back defenders didn’t take the ball out of the area, allowed Glendale sophomore forward Lepkin Davis to tie the game with a header. “We added a new player today in the defense and I think he did a really good job. I think overall they did a great job,” said Raygoza. ELAC is 2-4-1 overall. ELAC’s next game will be at home against Rio Hondo College on Friday at 4 p.m.